OVERVIEW: Spike TV was given exclusive access to follow a group of Special Agents and Task Force Officers in the DEA Detroit division as they risked their lives daily in the ongoing battle against illegal drugs. The series follows DEA Special Agents as they work cases ranging from street level dealers all the way up to international drug traffickers. “DEA: Detroit” underscores the danger Special Agents experience on a daily basis in order to do their jobs. Witness first-hand what it is like for DEA Special Agents to go out on undercover missions and pose as drug dealers. Viewers are there when the DEA breaks down doors as Special Agents conduct drug raids on stash houses that put their lives directly in the line of fire. 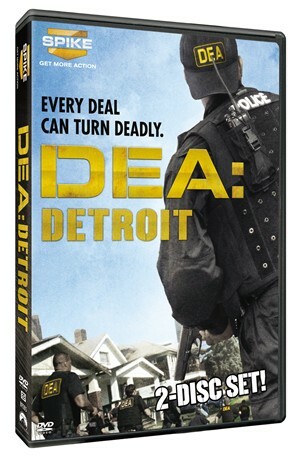 “DEA: Detroit” takes a look at the complex relationship that DEA Special Agents have with informants, revealing the strange kinship they share with these criminals who see themselves not as arch enemies, but rather as opponents in “the game” of the illegal drug trade. REVIEW: Another reality show based on one of nation's toughest agencies, the DEA. The series in essence does an excellent job capturing the hard work, the danger and the commitment by the agents in every operation. Putting in perspective the risk in order to keep the streets of Detroit clean of drugs. The season includes six powerful episodes, in which the audience get the opportunity to see how some of the DEA operations are run. Each episode provides a clear picture of the unpredictable ending that each operation can have in the life of these brave agents.